With the holidays quickly approaching, every content marketer wants to get in on the Christmas conversation. But is the right time now—or have you missed the holiday content train? Content marketing has been a key marketing strategy as early as the ’90s, and arguably sooner. But has content marketing run its course? Or is it a tactic that’s still thriving? Moving to a new city is exciting. It’s also a headache. The Pros: Living in a new place, meeting new people, eating at new restaurants, running new trails, trying new activities, getting your library card, checking out new bookstores—that’s just the start of the list. The Cons: Paperwork. Lots and lots of paperwork. That includes collecting every document you own, waiting, filling out online forms, waiting, standing in long lines, waiting, filling out paper forms, waiting, calling toll-free numbers, waiting, driving around town just to wait, wait and wait. I reached my breaking point at the credit union. After being turned away at the DMV to get my driver’s license, I went to establish a checking account in order to fulfill one of the many documents you must bring to get an in-state driver’s license. “I’m here to open an account,” I said. I explained my current situation. “Why can’t this be simple?” I exclaimed to the karma gods. And just like that, everything became easy. I opened my checking account. My Internet was working. And I got my in-state driver’s license. Why isn’t the system easy? I’m not talking politics here. I’m talking about the system of complication. Why do we make everything so difficult? Why must there be fine print? Why are there pages to read and multiple lines to sign? Why must we be versed in adult-speak to understand what’s being said in what we call official paperwork? An attribute of a strong writer is the ability to connect with the reader instantly, to write with a vocabulary that’s familiar and comfortable, to convey what needs to be said so that it can be easily understood. That brings me back to my original question: Why do we make writing so difficult? Readers are often clients and customers. And you’re not connecting with a reader when you hand them a stack of papers with thick paragraphs and pointing where they should sign. Instead, you’re alienating them. You’re showing them you don’t trust them. Or, worse, you’re using the written word to hide something from your reader. Think about your writing and your brand. What are your values? What is your philosophy? Is it being conveyed in your writing? Explain your product or service with words and images your audience will understand. Answer questions today that your audience wouldn’t think to ask until tomorrow. Never forget your audience. Are you speaking too technical? Are you making life harder or easier for your audience? Are you really understanding their situation? Creative writers, this goes for you too. Are you telling the story in the best way for your audience? Are you overcomplicating a situation in the story or overcomplicating how its being told? 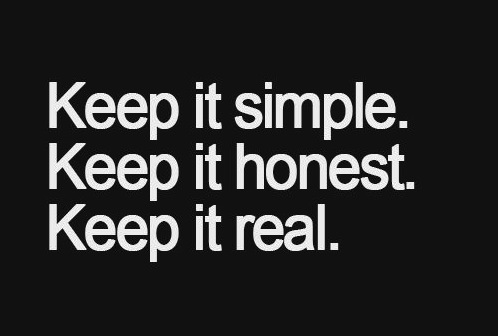 Keep it simple (stupid). Keep your writing simple not in a way that demeans your audience, but in a way that understands them, values them and enriches them. Because writing is about the journey. Let’s make it a pleasant one. What kinds of writing keeps it simple? What kinds of writing makes things difficult? Share below.